So very narrowly did he have it investigated, that there was no single hide or virgate of land, nor indeed (it is a shame to relate but it seemed no shame for him to do) one ox nor one cow nor one pig which was left out, and not put down in his record. Medieval chronicles are stuffed with hyperbole and one suspects that the intended readership was expected to be able to translate the references to the 50,000 men, 500 ships, and the like into the more realistic 'enough to knock your cowl off.' The writer of the 1085 annal of the Anglo-Saxon Chronicle knew full well that he was overstating the case, but he understood that his audience likewise would comprehend: the scale of the Domesday inquest was unprecedented. The initial reaction was horror, but in the course of time it changed to respect and then admiration; by the early twelfth century the Domesday inquest, and more particularly Domesday Book, had entered the popular imagination as an unimpeachable authority. It was a mystique that has remained into the present day. With the possible exception of Magna Carta, no other medieval document generated such enduring veneration. It is this, it seems, that is the abiding reason for the survival of so much documentation from the process. Medieval government was to be capable of producing more comprehensive surveys, but none would be able to muster such abiding interest. The volume of information is awesome. Where most surveys in the Middle Ages go largely unnoticed in the chronicles, there are two contemporary accounts of the Domesday inquest. The 1085 annal of the Anglo-Saxon Chronicle has already been cited. Bishop Robert of Hereford, probably writing in 1087, had a slightly different perspective. [In the] twentieth year of his reign by order of William, king of the English, there was made a survey (descriptio) of the whole of England; of the lands in each of the counties; of the possessions of each of the magnates, their lands, their manors (mansionibus), their men both bond and free, living in cottages or with their own houses and lands; of ploughs, horses, and other animals; of the services and payments due from all the men in the whole land. Other investigators followed the first and were sent to counties that they did not know, and where they themselves were unknown, to check the first description and to denounce any wrongdoers to the king. And the land was vexed with much violence arising from the collection of the king's taxes. A handsome body of evidence of procedure. Of the records that emanated from the process itself (table 1) the three largest are contemporary manuscripts. Exon is a composite document. The bulk of it is a series of accounts, fee by fee, of the lands of the king and his tenants-in-chief in Somerset, Dorset, Devon, and Cornwall with a single Wiltshire entry. Interspersed are geld accounts, related to an inquisitio geldi, lists of terre occupate, that is lands that had been illegally seized, and summaries of fees detailing total geld assessments, ploughs, population for the demesne and enfeoffed lands and a ploughland total for the whole fee. Welldon Finn established that Exon was written by a number of scribes and Caroline Thorn has shown that it is no coherent document. Each fee tends to be entered in its own quire, but the scribes change without any apparent pattern, even on occasion in the middle of a sentence, and there is much correction, emendation, and addition of material. There is no indication that the collection was originally bound, and it is best interpreted as a series of discrete sections united by a more or less common origin rather than an editorial schema. Douglas, D. C., 'Some Early Surveys from the Abbey of Abingdon,' EHR, 44, (1929), 623. Douglas, D. C., 'Some Early Surveys from the Abbey of Abingdon,' EHR, 44, (1929), 623-25. Cambridge, Corpus Christi College, MS 111, pp.128-9; Two Chartularies of the Priory of St Peter at Bath, ed. W. Hunt, Somerset Record Society, 7, (1893), 67-8. Two Chartularies of the Priory of St Peter at Bath, ed. W. Hunt, Somerset Record Society, 7, (1893), 35-6. Fowler, G. H., 'An Early Cambridgeshire Feodary,' EHR, 46, (1931), 422-3. Walmsley, J. F. R., 'Another Domesday Text,' Medieval Studies 39, (1977), 116. Douglas, D. C., Feudal Documents from the Abbey of Bury St Edmunds (London, 1932), 1-15. Feudal Documents from the Abbey of Bury St Edmunds, ed. D. C. Douglas (London, 1932), 15-24. Feudal Documents from the Abbey of Bury St Edmunds, ed. D. C. Douglas (London, 1932), 25-44. Rerum Anglicarum Scriptores Veteres, ed. W. Fulman (Oxford, 1684), i, 80-2. Roffe, D. R., 'The Descriptio Terrarum of Peterborough Abbey,' Historical Research, 65, (1992), 15-16. The Domesday Monachorum of Christ Church Canterbury, ed. D. C. Douglas (London, 1944), 80-1. The Domesday Monachorum of Christ Church Canterbury, ed. D. C. Douglas (London, 1944), 81-98. The Domesday Monachorum of Christ Church Canterbury, ed. D. C. Douglas (London, 1944), 98-9. The Domesday Monachorum of Christ Church Canterbury, ed. D. C. Douglas (London, 1944), 99-104. Inquisitio Comitatus Cantabrigiensis, ed. N. E. S. A. Hamilton (London, 1876), 168-73. Inquisitio Comitatus Cantabrigiensis, ed. N. E. S. A. Hamilton (London, 1876), 174-5. Inquisitio Comitatus Cantabrigiensis, ed. N. E. S. A. Hamilton (London, 1876), 175-83. Inquisitio Comitatus Cantabrigiensis, ed. N. E. S. A. Hamilton (London, 1876), 184-89. Sawyer, P. H., 'Evesham A, a Domesday Text,' Miscellany 1, Worcestershire Historical Society, (1960), 22-36. London, British Library, Cotton MS Vespasian B xxiv, f.11r. London, British Library, Cotton MS Vespasian B xxiv, f.57r-62r. London, British Library, Cotton MS Vespasian B xxiv, f.62r-63v. London, British Library, Harleian MS 3763, f.71v. London, British Library, Harleian MS 3763, f.82r. An Eleventh-Century Inquisition of St Augustine's, Canterbury, ed. A. Ballard, Records of the Social and Economic History of England, 4 (London, 1920), 1-33. Exeter, Exeter Dean and Chapter, MS 3500; Libri Censualis, vocati Domesday Book, Additamenta ex Codic. Antiquiss. Exon Domesday; Inquisitio Eliensis; Liber Winton; Boldon Book, ed. H. Ellis (London, 1816). London, British Library, MS Cotton Tiberius A vi, ff.36-69: Inquisitio Comitatus Cantabrigiensis, ed. N. E. S. A. Hamilton (London, 1876), 1-95. Cambridge, Trinity College, MS 0.2.1,ff.191v-221v; Cambridge, Trinity College, MS 0.2.41, pp. 161-274; London, British Library, Cotton Tiberius A vi, ff.36-69; Inquisitio Comitatus Cantabrigiensis, ed. N. E. S. A. Hamilton (London, 1876), 96-167. 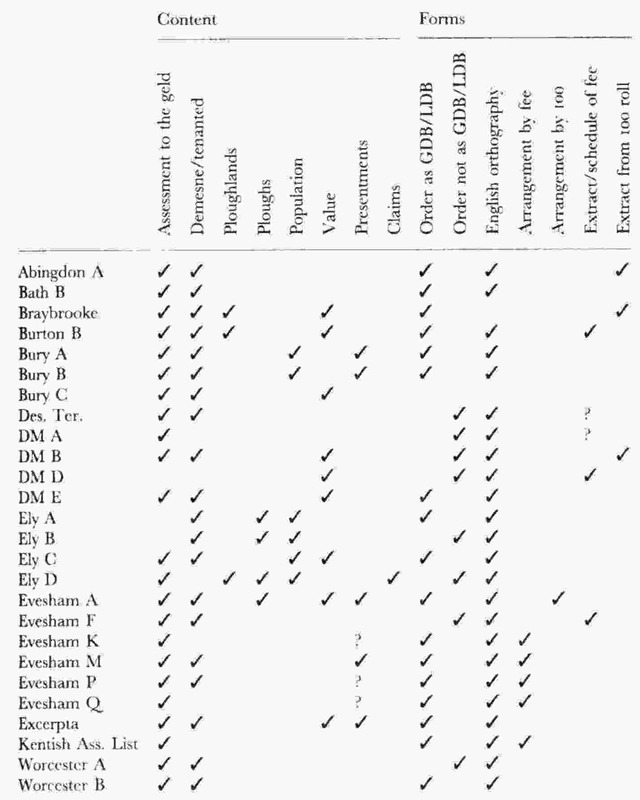 Hoyt, R. S., 'A Pre-Domesday Kentish Assessment List,' A Medieval Miscellany for Doris Mary Stenton, eds P. M. Barnes and C. F. Slade, Pipe Roll Society, ns, 36, (1960), 199-202. London, Public Record Office; Little Domesday Book, eds A. Williams, G. H. Martin (London, 2000). Hemingi Chartularium Ecclesiae Wigornensis, ed. T. Hearne (Oxford, 1723), 83-4. Hemingi Chartularium Ecclesiae Wigornensis, ed. T. Hearne (Oxford, 1723), 298-313. LDB and GDB, by contrast, are self-evidently compilations that follow a programme. LDB is confined to the three counties of Essex, Norfolk, and Suffolk which form the major divisions of the text. Within each county section the account proceeds by fees and concludes with a list of invasiones, illegal seizures of land. The volume is the work of seven scribes, the last of whom was responsible only for the colophon at the end of the volume, the running heads, and the rubrication. Nevertheless, it is apparently a fair copy, with relatively few corrections and additions. GDB exhibits much the same form. It covers the rest of England county by county and within each fee by fee. There are claims relating to lands in Yorkshire, Lincolnshire, and Huntingdonshire and a summary list of vills and manors in Yorkshire. The volume is, however, largely the work of one scribe with a second adding the odd correction or gloss, and, very occasionally, entry. It is, by far, the most accomplished of the Domesday manuscripts. The reader's eye is drawn to the names of manors by the use of rustic capitals and rubrication, and a standard layout was employed. It was evidently drawn up for reference use. The remaining documentation survives in later copies. Four texts are full Domesday-like compilations. ICC is the widest in scope, covering all the land in thirteen out of sixteen of the Cambridgeshire hundreds except for the demesne estates of the king. In marked contrast to the parallel account of the county in GDB, however, it is arranged by hundred and vill as opposed to fee. IE is a composite source. Surviving in three manuscripts, much of it is an account of the estates of Ely Abbey in the six counties in which it held land in a form that is very close to LDB and ICC. Additionally, however, it preserves what have been called the articles of inquiry in the prologue, lists of jurors for the counties of Cambridgeshire and Hertfordshire, summaries identical in form and content to those of Exon for a number of fees in Cambridgeshire and for Ely in Hertfordshire, Huntingdonshire, Norfolk, Suffolk, and Essex, and a schedule of Ely claims. Bath A is an Exon-like account of the lands of Bath Abbey in Somerset. The Crowland Domesday is a composite account of the lands of Crowland Abbey which draws upon the GDB account and an independent geographically-arranged list of vills and hundreds. The rest of the corpus consists of some twenty-seven texts that with varying degrees of detail which fall short of full Domesday descriptions. Apart from their relative brevity; there is nothing that characterizes them as a coherent group. Nevertheless, for convenience we shall call them these sources 'schedules.' Their salient features are summarized in table 2. Documents are, of course, meat and drink to the historian. We are all adept at validating and assessing our sources. The analysis of early charters is now almost a science with criteria drawn up to establish not only authenticity but degrees of authenticity. In some editions Anglo-Saxon charters are accorded stars like the best hotels. Similarly, chronicle criticism has been honed down to a fine art. Texts are collated and autographs or 'originals' are identified. These are disciplines that, in their place, have all been well-learned. I shall argue here, however, that they are inappropriate to inquest records and have in consequence misinformed historians about the nature of the Domesday sources and the relationship between them. Employing techniques of charter and chronicle criticism, much of recent Domesday scholarship has been concerned with producing a taxonomy of these sources. All of the texts in the Domesday corpus are in some way related to the Domesday inquest, but the problem has been to determine the nature of the relationship in each case. The most comprehensive examination of the corpus as a whole was undertaken by Dr Howard Clarke in 1985. He drew together analyses of individual schedules by a number of scholars, notably Galbraith, Sawyer, Harvey, and himself, to produce an account of the genesis of Domesday Book. He accepted that documents like Abingdon A and the Kentish Assessment List were pre-Domesday sources pressed into service in the inquest to inform the initial collection of evidence from the tenants-in-chief. Evesham A represents the sort of schedule that was then drawn up for validation by hundred jurors, and seigneurially-arranged Bath A and geographically-arranged ICC are representatives of the two types of source that their presentments took. From these county drafts regional returns, exemplified by Exon and LDB, were produced with the use of 'conversion tables' like Evesham K and Q which facilitated the transformation of a hundredal to a seigneurial form where necessary. Finally, GDB was produced by abbreviating the regional returns. This analysis accepts a number of assumptions that must be tested. The first relates to techniques of dating texts. That the Domesday inquest was conducted in 1086 is clear, but none of the Domesday texts is unambiguously dated. The colophon at the end of LDB states categorically that �this survey (ista descriptio) was made in the year one thousand and eighty six from the incarnation of the lord and the twentieth of the reign of william, not only throughout these three counties but also throughout the others.� It must be noted, however, that this is a postscriptal comment written by scribe 7, who did not otherwise participate in the production of the volume, and he almost certainly understood ista (�this there�) descriptio, as the survey itself rather than LDB. None of the remaining texts is explicitly dated, the best indication being a statement that a text or schedule was drawn up �when England was described� or the like. The problem is a common one with medieval records and the normal way of tackling it is to narrow down a date range from the known history of individuals and institutions. �Dead dating� works well with charters; people cannot grant land or witness transactions when they themselves are dead or not in office, and if they do a fishy smell hangs over the document. Unfortunately, however, the Domesday documents are not always amenable to this type of analysis. It has been asserted that the Kentish Assessment List must pre-date Domesday, inter alia, because in one entry GDB records a successor to the tenant. At best this can only prove that the document is earlier than GDB, a different matter from demonstrating that it precedes the Domesday inquest. At best, for Domesday texts are often imprecise in their record. Queen Matilda appears as a tenant-in-chief in the Buckinghamshire folios and yet at the beginning of 1086 she had been dead for over two years. The problem is even more acute with holders of land before 1086. The assize (the temporal limit of the inquiry) was set at �the day on which King Edward was alive and dead� at an early stage in the process, although this had been amended to the more realistic �in the time of King Edward� by the time GDB came to be written. Thus, it is often assumed that a past tense in a Domesday text can be safely translated as �before 1066.� In fact, the referent might be to any predecessor in the previous thirty years. Earl Siward appears regularly in the Northern folios and yet he died in 1055 and Earl Waltheof more widely, although he was still in possession of his lands within a decade of the inquest. Domesday was dependent on its sources and these were various. On these grounds content is an equally treacherous anchor. Bath B might seem to be earlier than the acquisition of Tidenham by Earl Willaim fitzOsbern between 1066 and 1069, for it ascribes the manor to the demesne of the abbey of Bath. And yet Ely D show that schedules of claims were drawn up at an early stage of the inquest and the common enrolment of such lands in the breves of the claimants shows that they influenced the composition of the texts. Bath Abbey, then, may have simply been making a pitch for land formerly lost. Its overwise close agreement with the parallel section of GDB suggests that Bath B is closely associated with the Domesday inquest. Again, Sally Harvey dates Abingdon A as pre-Domesday because it records TRE geld assessments where GDB has TRW figures. Inherent in her argument is the assumption that the purpose of the geld inquest, which she saw as a contemporary but independent initiative, was to reassess tax liability. This is in itself questionable, but even within its own terms the argument does not work. In many counties TRE assessments are given and there is no indication that a reassessment was ever intended; Domesday hidation survived in many cases into the thirteenth century and occasionally beyond. But more to the point in Cambridgeshire there was a reduction in liability between 1066 and 1086 and yet both assessments are used in different contexts throughout the Cambridgeshire text. Abingdon Abbey seems to have maintained two different assessments, one for acquitting service to the king and one for its own tenants. It would seem that the burden of the Danegeld might be reduced but by necessity other dues continued to be calculated on the older assessments. Dead dating is, then, of dubious value. Given the manifold sources of the Domesday texts, it will probably always be misleading in providing a terminus ante quem; a reference to a person will not be an adequate ground for fixing a date before which a text was written. It can be of more positive use in determining a terminus post quem. It is self-evident that a document that makes reference to King William must have been written after 1066. On these grounds Dr Christopher Lewis was able to argue that GDB must post-date the death of William the Conqueror, if only in part, because in the Huntingdonshire and Surrey folios William de Warenne is called Earl William, a title he was granted by William Rufus. In this case, however, the deduction can only be made because it is apparent from the manuscript that comes, 'earl', is an integral part of the text. Where such a reference is postscriptal certainty dissolves. Claims have long been made that the Surrey section must already have been written when William the Conqueror issued a writ, 'after the description of the whole of England,' which set the assessment of Westminster Abbey's manor of Pyrford in Surrey at 8 hides, for in GDB the scribe originally recorded its liability as 16 hides only subsequently to add postscriptally that 'it now gelds for 8 hides.' The assumption, however, is unwarranted. The writ clearly sets a terminus post quem for the addition, but can hardly provide a terminus ante quem for the text itself. At most it can be said that the information was not in the scribe's original source. Here we must substitute a positive with a qualified negative. Where we have original working documents this is often possible. Even qualified negatives, though, can become meaningless when we have texts only in later copies, for there is generally no way of knowing whether a reference is integral. Evesham K contains surveys of Gloucester and Winchcombe with information that dates them to c.1100, but this hardly dates the whole text. Rather it merely provides a terminus post quem for that part and may or may not provide a terminus post quem or indeed a terminus ante quem, for the rest of the text. Place-name forms, it is true, can sometimes hint at different strata in compound documents, but it can never be assumed that a scribe always copied what was before him. In the Crowland Domesday place-names were modernized to fourteenth-century forms except for those of places in which the abbey no longer had interests at the time of writing, and it would seem that the scribe only accurately copied those that were unfamiliar to him. If precise dating is elusive, textual forms promise the possibility of constructing a relative chronology. Frank and Caroline Thorn have eloquently demonstrated how the language and layout of Exon have directly influenced the production of GDB. The GDB scribe's repeated transcription of textual peculiarities and misunderstandings of emendations demonstrate beyond doubt that the Exeter text was his principal source for the account of the South-Western counties. Where one or both texts are later copies, this sort of analysis is rarely possible, but diplomatic may betray a relationship. The geographically-arranged ICC is a case in point. The account of each vill commences with the statement 'X [the place] defended itself for y hides, A1 holds....' while other fees in the same vill have the form 'In the same vill A2 holds..' These forms are consistently translated into GDB as X defended itself for y hides..' and ' In X A holds...' and it is thus clear that ICC precedes the account and was probably a principal source. More subtle are editorial reorganizations of material. The GDB scribe is consistently more concise and organized than the scribes of Exon with only the occasional slip hinting at his more expansive source. They in their turn had imposed their own concept of what was required upon their material and the process indicates that Bath A was one of their sources. In content this document varies little from Exon, but where the one lists demesne and villagers' hides followed by demesne and villagers' ploughs, the other regroups the information so that the demesne assessment and ploughs come first. Furthermore, its language is somewhat looser. All in all, it seems clear that it was slightly earlier than Exon. The organization of texts may also hint at a relationship. Common sequences of vills and hundreds are ubiquitous in the Domesday corpus and in themselves prove little beyond a common identity in a process: many a schedule exhibits a structure that is identical with that of LDB or GDB, but it may as easily be a precursor of the engrossed texts as an abstract or extract thereof. Evesham K and Q are difficult to interpret on these grounds. Rather it is in the disruption of sequences that relationships become apparent. The Suffolk section of IE shares a villar sequence with its LDB counterpart, but the order of hundreds is completely different. It would thus seem that it was extracted from a geographically-arranged source in which each hundred was entered in a separate quire and as such it represents a precursor of the LDB text. Again, however, the phenomenon is not always easy to interpret. It has been commonly assumed that the sequences are ultimately derived from the order in which hundred juries were called to make their presentments, and it therefore follows that aberrant forms must precede that stage in the inquiry. On these grounds Professor Sawyer has claimed that Evesham A stands at the very beginning of the Domesday process, representing a geographical arrangement of seigneurial returns preparatory to validation by the hundred juries. In reality, however, changes could be made at later stages in the process. The bishop of Worcester's breve in the Worcestershire folios of GDB is radically different in organization from the rest of the Worcestershire text, but it manifestly postdates the presentments of the hundred juries. Similarly, the Yorkshire Summary appears to postdate hundredal presentments, for it is the formal archetype of much of the Yorkshire text, but in the account of the lands of the Count of Mortain there is a disruption of that order occasioned by a scanning of the Summary exemplar a number of times. The problem here is not only one of choosing the right characteristics to compare, it is also one of perception. All too often the production of the Domesday texts has been seen in rigid, mutually-exclusive stages, witness the table produced by Clarke. Symptomatic of this attitude is the assumption that, like chronicles, all documents have a single stemma, that is a straight line of transmission from a single original. The upshot has been to elaborate the taxonomy. Time and again it is asserted that if two documents share material but each contains data that are not found in the other, then they must be independently derived from a third source. So the Braybrooke Cartulary schedule has given birth to an ur-ICC and Exon to an intermediary before GDB. In reality, however, there is no necessity for documents to be copied from one source: many are patently compilations form a number of sources. The concept of a stemma is, then, an unhelpful one, for it applies a model of authorship to a process that is of necessity other. The neat taxonomy that Clarke produces is less a function of what the texts themselves tell us than of a preconceived notion of what the Domesday process was about. What other reason is there for putting Evesham A at the head of the queue than a conviction that Domesday Book was from the outset the aim of the Domesday inquest? We are repeatedly told that all the Domesday texts with the exception of GDB are 'satellites,' they are merely a means to an end. Only thus has it been possible to put them into an order. It seems to me that the authority for this concept is dubious. The so-called 'articles of inquiry' preserved in the prologue to IE have frequently been adduced as evidence of the purpose of the inquest at its earliest stage. They are, however, bad evidence. The articles are undoubtedly in a form that is very like that of Domesday Book: what is the name of the manor, what is its assessment to the geld, how many ploughs are there, how many men, what are its resources, what is it worth. But this list of questions does not necessarily imply a feudal survey. No mention is made of the fee and it could as easily have informed the account of each holding within the vills of ICC as a GDB-like source. In fact, the list is almost certainly very late in the Domesday process. Its very similarity to GDB should long ago have cast suspicion upon it. With no notice made of demesne livestock, it seems hardly possible that it could have informed the process that produced Exon, ICC, IE, or LDB. If not a literary conceit of the late twelfth century when IE was compiled, the list was probably drawn up as an abbreviation guide for the GDB scribe. The form of Exon has been cited as further evidence that the production of Domesday Book was the aim of the Domesday inquest. Galbraith took issue with J. H Round who believed that ICC was the typical product of the inquest. His objections, however, were misconceived. Whereas ICC was compiled from various sources to a conscious plan, Exon was a working record. Its form, then, is contingent to the aim of the inquest since it was a function of its sources. As Galbraith himself rightly divined, much of the Domesday data could only come from the tenant-in-chief and it was therefore inevitable that it should be first written down in a 'seigneurial' form. On its own the form of Exon is no conclusive evidence for the aim of the survey. No more so is the form of ICC. In reality, what evidence the Domesday sources afford suggests that there was no one single enterprise. The Anglo-Saxon annalist pointedly contrasts an audit of 'how many hundred hides there were in the shire, or what land and cattle the king himself had in the country, or what dues he ought to have in twelve months from the shire' with a survey of the lands and resources of his tenants-in-chief in the words 'also he had a record made of how much land his archbishops had, and his bishops, and his abbots and his earls.' At least some of the Domesday texts may relate to the former process. Abingdon A is said in the apology that introduces it to have been derived from a hundredally-arranged source which was kept in the Exchequer with Domesday Book, and the compiler of the Crowland Domesday refers to hundred rolls likewise kept with Domesday which he had consulted. Several other records make reference, more or less unambiguously, to similar records. It seems clear enough that any examination of the processes of the Domesday inquest must start with those documents that can be related to each other, that is, Exon, ICC, IE, and above all LDB and GDB. Devoid of any clue as to their provenance and function, the remaining texts are useless as guides. The origins of some will probably always remain uncertain. For most the best that can be hoped for is a suggested function once different processes have been identified in the principal Domesday texts. The Domesday texts, then, do not obey the rules of charter and chronicle criticism and they should not be made to do so. In essence the inquest was an investigation, and like all effective investigations its correspondents and sources were manifold. It took evidence from representatives of all levels of society from the humblest peasant to the greatest lord, and it drew on routine administrative and estate documents as well as its own records. By its nature its sources were multifaceted and attempts to formulate a taxonomy inevitably traduces the process. We have to resign ourselves to the fact that sometimes we will remain uncertain about the function of a document. But in return we have a much richer understanding of the truly communal enterprise that was the Domesday inquest.